This was part of a questionnaire that I did for a yoga website, but they never published any of it. I spent a lot of time on it and (I think) it’s interesting reading, so I’m publishing it on my blog. If you are thinking about doing yoga teacher training then it’s definitely worth reading that part of it. If you are interested in my yoga “journey” and how I became a teacher, then read on too! 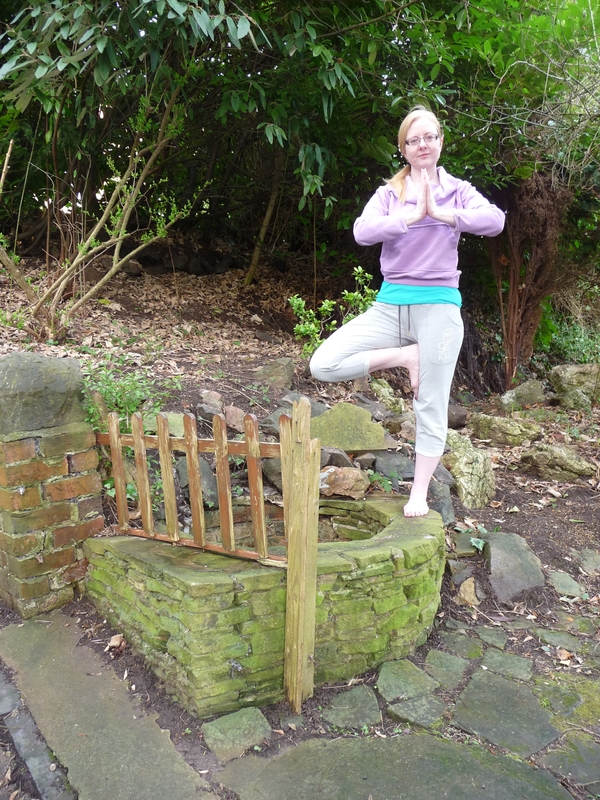 Kat from Malvern Wells Yoga, on her own personal garden well. I’d always wanted to try yoga and one day I saw an advert in the local paper for an Ashtanga class starting soon at the rugby club. I knew I just had to go! What got you ‘hooked’ on yoga? What’s yoga to you? In my childhood I did gymnastics and dancing and my sister and I were very active children, every day after school we were dancing or swimming or going to gymnastics at the weekend. We were always prancing around the living room at home, making up dances and practicing handstands! I think it all started to go a wrong when I was in Sixth Form and then at university. I didn’t have time to eat properly because I was so busy and I didn’t really know how to cook properly for myself. I must point out here that it wasn’t for want of trying on my mother’s part, I just wasn’t interested in learning. On top of that, at university I used to get very lonely, especially when I lived abroad. Comfort eating became the norm for me. At my biggest I was a UK size 20. At the time I went to my first yoga class I was about 23 years old and a UK size 16-18. I’d gotten to the point where I didn’t want to be fat anymore. I can hear myself like a stuck record, “Does this make me look fat? and “Does my bum look big in this?”…and quite honestly, it did! I used to wear black all the time in an effort to hide my body. When I went to my first class I think my body remembered how good it feels to stretch and bend. I think my body was hooked and my mind followed naturally! Yoga to me is a way of life now. It has helped me achieve balance between my mind, my body and my spirit. It has educated me about what my body is for and how I must look after it. Yoga has contributed to my level of self-confidence and self-belief. My life now has perspective. I decided a long time ago that I wanted to do teacher training. I know that I can help people to become more aware, more mindful and to look after themselves better, to appreciate themselves, to find courage, to let go of the little things and embrace the big things… the list goes on. I was made redundant in February 2012 and I was lucky to get a decent payout. I used some of the money to pay for my teacher training. If I hadn’t been made redundant my dream of being a yoga teacher may never have been realized. For you, what are the main qualities of a good yoga teacher? I think a yoga teacher should be reachable… let me explain. I’ve met yoga teachers who are ethereal. They waft into class and out again like minor celebrities… I’m not like that. I’m me… and I don’t waft anywhere, nor do I own a kaftan or regularly paint henna tattoos on my hands. I don’t exude a ‘more-yogi-than-thou’ attitude. I think a good yoga teacher is attentive to the needs of their students, is encouraging, can relate to their students… and most of all, lives in the real world. Do you plan to earn your living mainly as a yoga teacher? Yes, eventually I’d love for that to be possible. If so, did you have a different career before this? If not, what’s your “day job”? At the point I was made redundant, I was a marketing manager in the packaging industry. Right now I am a procurement manager in the food industry. I buy blueberries! This is not to be confused with blackberries, or mobile phones. How was your teacher training? I loved it! It was one of the hardest things I’ve ever done, but also one of the most rewarding. We were a group of around 30 ladies and one gentleman and we came from all four corners of the globe. There was the inevitable amount of tears, pain, self-doubt, bitching, homesickness… What do you expect when living with 30 other females for three weeks?!! The amount of asana practice naturally brings out the emotional side of even the hardest of people! The great thing about Suryalila is that the accommodation is in little houses which allows you to bond with your roomies. This really helps when you are suffering bouts of inadequacy and inability to do a proper yoga handstand and not a gymnastic one! What did it cost? Did you travel to a far away place for the program? I went to Andalucia in Spain. The beautiful scenery helped both mind and body. There’s a whole spirituality around Suryalila and the people who work and volunteer there. It is a very special place. Did your teacher training fully prepare you to become a yoga teacher? Are there aspects that you wish had been covered more in depth/differently? Yes… and no! I think continuing education is important and it is vital to start teaching as soon as possible after you’ve finished your course. We were advised to teach ten classes for free as soon as possible after our course finished. I finished teaching my ten classes at the end of 2012. I taught my ten classes to a group of beginners made up of my beautician, her best friend and her best friend’s mother-in-law! They have been the most fantastic, encouraging group. Two of them were complete strangers when I started and I think that helped! As regards what could have been more in depth about my training: more advice about teaching beginner classes. Perhaps more in-depth training about dealing with injuries… I’d like to understand more about anatomy. The anatomy training was very good and it has whetted my appetite to find out more about how the body works. I also wish there had been one more teaching session. We did two 75-minutes of teaching each. It was THE scariest thing. I wish there had been one more, just to give me that extra bit of confidence and teaching time. What advice do you have for people looking for a yoga teacher training program? Do it!! Don’t be under any illusions that it’s easy though. Being away from your husband and other loved ones for three weeks was the absolute hardest thing, you have to be prepared for that! It’s not for the faint-hearted and no amount of pre-prepared fancy yoga poses will give you the mental strength you need to get through it. What criteria should they be looking at? To be perfectly honest I would say that if you are spending that amount of money, location needs to be a factor! Why do it in rainy old Britain when you can go to Thailand and Costa Rica!! Obviously there are other important factors, like the quality of the principal teachers. Do your research about who they are and their experience. Plus, look at the contents of the program. The important things are time spent on teaching asanas to people, deepening your own understanding of yoga and building your ability to actually teach a class. Malvern is quite a holistic community. It is a very spiritual place. We are small town in Worcestershire, but there are plenty of yoga classes around the place at all times of day. Do you do private lessons? Teach classes in a yoga studio? In a gym or health club? I want to be able to teach private lessons. At the moment I’m teaching one class per week in a local church hall. In the New Year I’m going to be starting as a teacher at a retreat that is opening up near my home… as well as doing a full-time job… and I would like to get another class going on a Monday evening – y’know, after the weekend and all that 😉 – hangover busting, energizing, Monday night work out! I love it when my students are coming out of Savasana and they uncurl on their mats like little flowers seeking the sun. They tell me they feel relaxed and peaceful. I love the effect yoga can have on people. Is there anything that you find challenging/difficult when you’re teaching? I’m still a little scared about getting off my mat and assisting people, especially beginners. I don’t want to push them too far or hurt them. Have you found it easy to find teaching gigs? Are there a lot of opportunities for you and you have to turn down classes, or is it hard to find jobs? Well, I’ve gone out and created my own teaching gig. This was pretty easy – a few willing victims(!) and a small room at the church hall. As I said earlier, I am going to be teaching at a newly-opened retreat too and I found that by generally searching for ‘yoga’ in my area. How do you market yourself? Do you find it easy? I’ve not really started marketing myself yet. I have a domain name, and that’s it. So now that you are a yoga teacher, what’s your immediate plan (if you have one)? I need to contribute to my half of our mortgage! I would dearly love to throw in the corporate towel… but right now I have to be realistic. I love yoga and I want to continue to teach it for the love of it rather than the financial gain… and I also need to pay my way on a 200-year old cottage. Unless I am assured of a reasonable financial gain from teaching yoga, I cannot afford to give up my full-time job just yet! In an ideal world, as regards your yoga teacher career, where do you see yourself in 10 years? What kind of teaching will you be doing, to whom, where, etc? Will you be rich? Poor? Happy? Oh, in 10 years I know I will be happy! I’d love for yoga to be a full-time career for me. I’d love to own a yoga studio, or build my own and offer all sorts of different types of yoga and have a space that appeals to everyone… somewhere you can come and feel safe and at home, knowing that you are amongst like-minded people. I’d have a vegetarian café and a shop selling lovely yoga-esque goodies. I don’t care if I’m rich or poor, as long as we still have our lovely house and we are both healthy and happy. If you had one piece of advice to give to someone who wants to become a yoga teacher, what would it be? Believe in yourself and remember why you wanted to be a yoga teacher in the first place. Yoga is an addiction for me. I can’t get enough of it. If you have that drive, it can only carry you forwards. Categories: Uncategorized | Tags: Ashtanga Vinyasa Yoga, Suryalila, Yoga teacher training | Permalink.